Data Sources are the data areas held within the UI, structured by the Entities, that are used by the App pages and Functionality Actions in the App. Name - Each data Source must have a name to identify it within Pages. 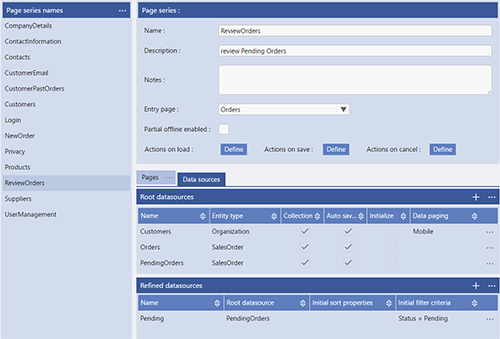 Entity Type - Each Data Source must have an Entity Type that defines the structure of the Data Source to match a specific Entity. Auto Saved - the Auto Saved option defines if a Data Source is connected to the automatic save/cancel buttons in the App. Data Sources are the means by which in memory data (in the App) is bound onto visible data (within the UI). Data Sources are the place where Repository Data is retrieved and stored for use by the App and the returned (saved) to the Repository. Data Sources are populated by Selections or UI widgets that trigger Data Retrieval from the repository. Data is returned to the repository from the Data Source by the functions of the App Save/Cancel buttons or UI widgets that trigger Data Saving. Refined Data Sources are a mirror of the Data Source that they are linked to by setting a Data Source as a Refined Data Source's Root Data Source. There are two main purposes of Root Data Sources, 1) to provide the data populated in the Root Data Source in a different view i.e. Sorted or Filtered and 2) to provide the App user with the option of sorting, searching and filtering data displayed in the App. Global Data Sources are Data Sources that are available throughout the App not just in the Page Series that they are defined in. Global Data Sources are defined in the App Settings.